How old is the Earth? This question preoccupied first philosophers, then scientists, for many centuries. Today, we know that the age of the Earth is approximately 4.54 billion years, with an error range of about 50 million years (4.54 × 109years ± 1%). This number is based on evidence from radiometric dating of the oldest-known terrestrial rocks as well as lunar rock samples Notes 1 and meteorites. The age of the Earth is approximately 4.54 billion years. 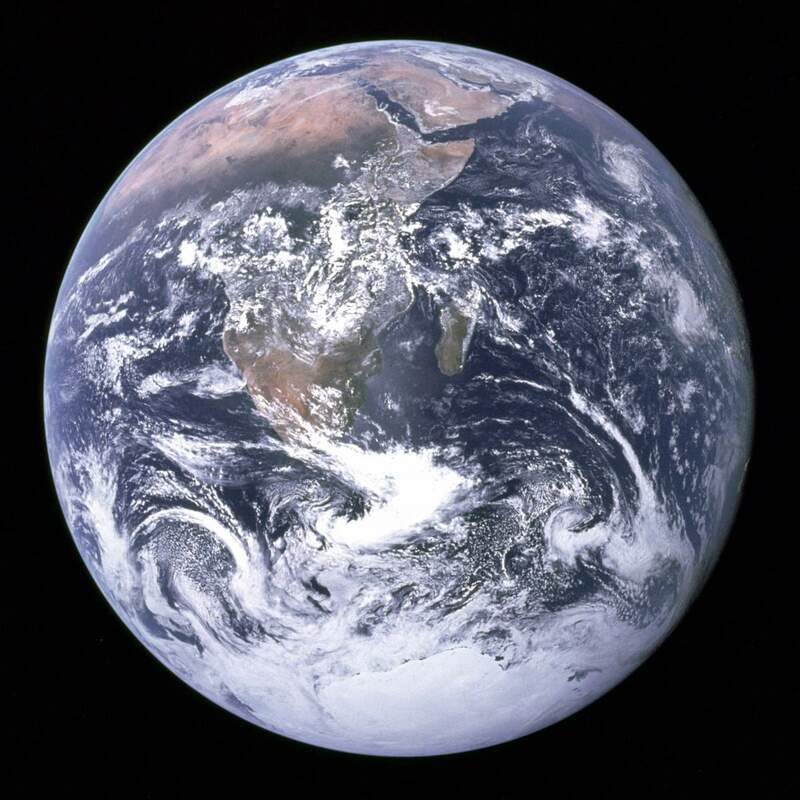 Image: The Blue Marble – Earth as seen by Apollo 17 in 1972, at a distance about 45,000 kilometers (28,000 miles). The Earth is actually a fast-moving spacecraft. It orbits around Sun with an average speed of about 30 km/s (67,000 mph or 108,000 km/h), but what’s more, our galaxy, the Milky Way also rotates. It makes one rotation every 250 million years or so. 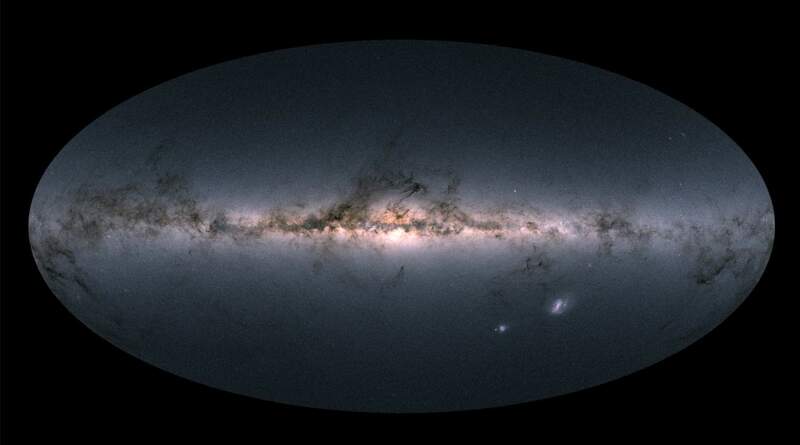 As a result, our planet is approximately 18 galactic years old. Only a “galactic” year before, there was a supercontinent called Pangaea or Pangea. The Age of the Dinosaurs (Mesozoic Era) was just started, and mammals had yet to evolve. And, dubbed as the “mother of all extinctions” or “the great dying”, the Permian–Triassic extinction event, the most profound mass extinction in Earth’s history, was in progress. For comparison, the Milky Way galaxy is approximately 13.2 billion years old, while the universe itself has been dated to 13.8 billion years. Ancient Greek philosopher and scientist Aristotle (384-322 BC) believed that the Earth (actually the Universe) has always existed. But, he posited a geocentric cosmology which was widely accepted up until the 16th century. According to Aristotle, the Earth is the center of the Universe. So, one can draw a conclusion that he believed that the Earth is eternal. Roman poet and philosopher Lucretius (99 BC – c. 55 BC) believed its formation must have been relatively recent, given that there were no records going back beyond the Trojan War (the war waged against the city of Troy by the Achaeans or Greeks after Paris of Troy took Helen from her husband Menelaus, king of Sparta; in Greek mythology). Early church commentators (Clement of Alexander, Origen, Eusebius, Lactantius, Theophilus, etc.) believed that since Adam was created on the 6th day after creation, that Jesus would come into the world in its 6,000th year. So, according to them, the creation date of Earth was 6000 BC. Bishop James Ussher in the 17th century estimated that the Earth was created in 4004 BC. Starting from the 17th century, with the development of the scientific method, observation began overtaking such thinking. In the 1660s, Danish scientist Nicolas Steno (1638-1686) formulated our modern concepts of deposition of horizontal strata. He wrote in his Dissertationis prodromus of 1669 that “… at the time when any given stratum was being formed, all the matter resting upon it was fluid, and, therefore, at the time when the lower stratum was being formed, none of the upper strata existed”. He argued that fossils were the remains of once-living organisms and he noted that different strata contain different kinds of fossil. The common opinion was that the fossils naturally grew in the rocks, like ancient authors wrote. Later, Scottish geologist, physician, chemical manufacturer, naturalist, and experimental agriculturalist James Hutton FRSE (3 June 1726 – 26 March 1797) maintained that the Earth must be much older than a few thousand years old, with a history extending indefinitely into the distant past. Some of his writings also anticipated the Gaia hypothesis: in 1785, he stated that the Earth was a superorganism and that its proper study should be physiology. In the 1790s, English geologist William Smith (23 March 1769 – 28 August 1839) hypothesized that if two layers of rock at widely differing locations contained similar fossils, then it was very plausible that the layers were the same age. William Smith’s nephew and student, John Phillips (25 December 1800 – 24 April 1874), later calculated by such means that Earth was about 96 million years old. In 1779 the French naturalist, mathematician, cosmologist, and encyclopedist Georges-Louis Leclerc, Comte de Buffon (7 September 1707 – 16 April 1788) tried to obtain a value for the age of Earth using an experiment: He created a small globe that resembled Earth in composition and then measured its rate of cooling. Basing his figures on the cooling rate of iron tested at his Laboratory the Petit Fontenet at Montbard, he calculated that the age of the Earth was 75,000 years. In 1864, the Scots-Irish mathematical physicist and engineer William Thomson, 1st Baron Kelvin (6 June 1824 – 17 December 1907) published calculations that fixed the age of Earth at between 20 million and 400 million years. These wide limits were due to his uncertainty about the melting temperature of rock, to which he equated the earth’s interior temperature, as well as the uncertainty in thermal conductivities and specific heats of rocks. Many biologists had trouble accepting such a short age for Earth. As Darwin’s theory of evolution was gaining wider acceptance, even 100 million years seemed much too short to be plausible to the biologists. In a lecture in 1869, Darwin’s great advocate, English biologist Thomas H. Huxley (4 May 1825 – 29 June 1895), attacked Thomson’s calculations, suggesting they appeared precise in themselves but were based on faulty assumptions. But, physicists at the time were thinking that the Earth couldn’t be older than around 20 million years. They assumed that the Sun was only glowing from the heat of its gravitational contraction. The process of solar nuclear fusion was not yet known to science. So, German physicist Hermann von Helmholtz (in 1856) and Canadian-American astronomer Simon Newcomb (in 1892) contributed their own calculations of 22 and 18 million years respectively to the debate. Other scientists also backed up Thomson’s figures – even the astronomer George H. Darwin, Charles Darwin’s son. Darwin proposed that Earth and Moon had broken apart in their early days when they were both molten. He calculated the amount of time it would have taken for tidal friction to give Earth its current 24-hour day. His value of 56 million years added additional evidence that Thomson was on the right track. Over the years, William Thomson refined his arguments and reduced the upper bound by a factor of ten, and in 1897, now Lord Kelvin, ultimately settled on an estimate that the Earth was 20–40 million years old, and probably much nearer 20 than 40. In a letter published in Scientific American Supplement 1895 Kelvin criticized geologist’s estimates of the age of rocks and the age of the earth, like estimates of Charles Darwin, as “vaguely vast age”. On 17 May 1899 Irish physicist John Joly FRS (1 November 1857 – 8 December 1933) read his paper, “An Estimate of the Geological Age of the Earth” to the Royal Dublin Society. In it, he proposed to calculate the age of the Earth from the accumulation of sodium in the waters of the oceans. He calculated the rate at which the oceans should have accumulated sodium from erosion processes and determined that the oceans were about 80 to 100 million years old. The use of radiometric dating was first published in 1907 by the American chemist Bertram B. Boltwood (July 27, 1870 – August 15, 1927). The technique is now the principal source of information about the absolute age of rocks and other geological features, including the age of fossilized life forms or the age of the Earth itself. It is a technique used to date materials such as rocks or carbon, in which trace radioactive impurities were selectively incorporated when they were formed. The method compares the abundance of a naturally occurring radioactive isotope within the material to the abundance of its decay products, which form at a known constant rate of decay. It can also be used to date a wide range of natural and human-made materials. The early pioneers of radioactivity were Boltwood and the New Zealand-born British physicist Ernest Rutherford (30 August 1871 – 19 October 1937). In radioactive decay, an element breaks down into another, lighter element, releasing alpha, beta, or gamma radiation in the process. They also determined that a particular isotope of a radioactive element decays into another element at a distinctive rate. This rate is given in terms of a “half-life”, or the amount of time it takes half of a mass of that radioactive material to break down into its “decay product”. Some radioactive materials have short half-lives; some have long half-lives. Uranium and thorium have long half-lives, and so persist in Earth’s crust, but radioactive elements with short half-lives have generally disappeared. This suggested that it might be possible to measure the age of Earth by determining the relative proportions of radioactive materials in geological samples. In reality, radioactive elements do not always decay into nonradioactive (“stable”) elements directly, instead, decaying into other radioactive elements that have their own half-lives and so on, until they reach a stable element. Such “decay series”, such as the uranium-radium and thorium series, were known within a few years of the discovery of radioactivity, and provided a basis for constructing techniques of radiometric dating. Boltwood’s studies were flawed by the fact that the decay series of thorium was not understood, which led to incorrect results for samples that contained both uranium and thorium. However, his calculations were far more accurate than any that had been performed to that time. Refinements in the technique would later give ages for Boltwood’s 26 rock samples of 410 million to 2.2 billion years. Later, the British geologist who made two major contributions to the understanding of geology, Arthur Holmes (14 January 1890 – 20 September 1965) argued strongly for radioactive methods compared with methods based on geological sedimentation or cooling of the earth (many people still clung to Lord Kelvin’s calculations of less than 100 Ma). He estimated the oldest Archean rocks to be 1,600 Ma, but did not speculate about the Earth’s age. By this time the discovery of isotopes had complicated the calculations and he spent the next years grappling with these. His promotion of the theory over the next decades he earned the nickname of Father of modern geochronology. By 1927 he had revised this figure to 3,000 Ma and in the 1940s to 4,500±100 Ma, based on measurements of the relative abundance of uranium isotopes by the American physicist who pioneered the development of mass spectrometry, Alfred O. C. Nier (May 28, 1911 – May 16, 1994). Today, as mentioned in the opening paragraph, based on evidence from radiometric dating of the oldest-known terrestrial rocks as well as lunar rock samples Notes 1 and meteorites, we know that the age of the Earth is approximately 4.54 billion years, with an error range of about 50 million years (4.54 × 109 years ± 1%). Samples returned from the Apollo and Luna missions revealed ages between 4.4 and 4.5 billion years, helping to constrain the age of Earth. Scientists have also studied meteorites more than 70 meteorites have fallen to Earth to have their ages calculated by radiometric dating. The oldest of these have ages between 4.4 and 4.5 billion years. There are also martian rocks samples exist in the form of meteorites that fell to Earth long ago. Some of these samples have been dated to 4.5 billion years old, supporting other calculations of the date of early planetary formation. Aerial photo of Barringer Crater which helped calculating the age of the Earth. Image: Wikipedia. 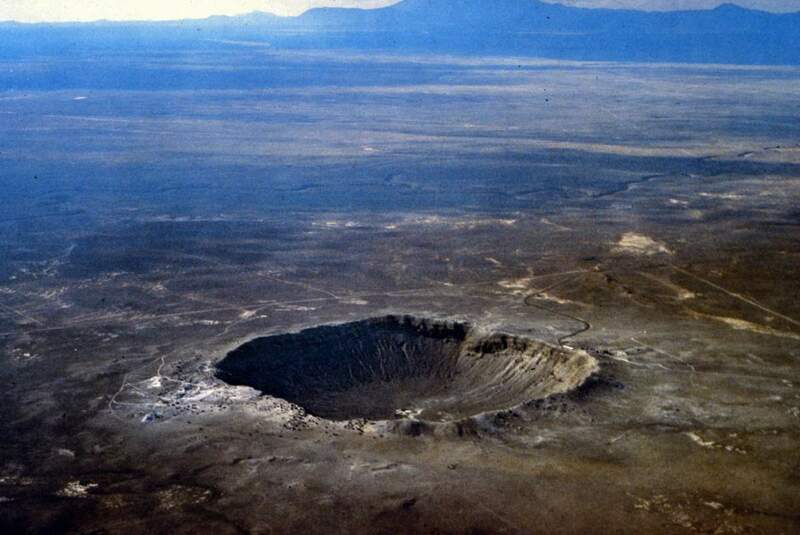 About 50,000 years ago, an asteroid hurled down from space to form Meteor Crater in Arizona: the Barringer Crater. Shards of that asteroid have been collected from the crater rim and named for the nearby Canyon Diablo. In 1953, the American geochemist Clair Cameron Patterson (June 2, 1922 – December 5, 1995) measured ratios of lead isotopes in samples that put tight constraints on Earth’s age. The Canyon Diablo meteorite is important because it represents a class of meteorites with components that allow for more precise dating. Samples of the meteorite show a spread from 4.53 to 4.58 billion years. Scientists interpret this range as the time it took for the solar system to evolve, a gradual event that took place over approximately 50 million years. The age determined from the Canyon Diablo meteorite has been confirmed by hundreds of other age determinations, from both terrestrial samples and other meteorites. Rocks that were ejected naturally from the lunar surface by cratering events (meteor impacts) and subsequently fell to Earth as lunar meteorites.